Built on the seafront in the first half of the eighteenth century, it was not by chance that the Greek Orthodox church was dedicated to Saint Nicholas, the patron saint of sailors, ship owners and all those involved in maritime trade, and to the Holy Trinity. 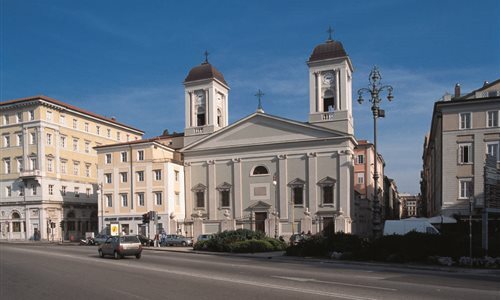 The Greek community was one of the most active in making the city of Trieste an important commercial hub. The Greek Orthodox Church, where the first mass was held on 18 February 1787, features a basilica floor plan having a nave without aisles. The interior features gilded wood icons and paintings with gilt backgrounds or silver rizas (covers). On the side walls there are two large paintings by the artist Cesare dell'Acqua, depicting the Preaching of John the Baptist and Christ with the Children.